This is an early Iron Age gold appliqué, dating to the 5th century B.C. It belongs to the Eastern European Sakae culture, of a Royal Scyth. The appliqué is made from a hammered gold sheet, decorated with a repoussé design. The back of the appliqué is folded for attachment. Such items were worn sewn onto clothing, or attached to an elaborate headdress. It is a superb and very bold example, slightly split from the excavation. 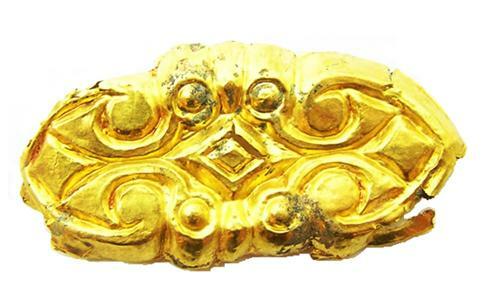 It is a great looking piece of early gold, in excellent excavated condition. DATE: c. 5th century B.C.